The implementation is simple genius. It’s a browser that starts up full screen (kiosk mode) and just sits there and updates occasionally. DakBoard provides the private webpage and tools to make that happen. You can certainly build this yourself with any number of open source tools. 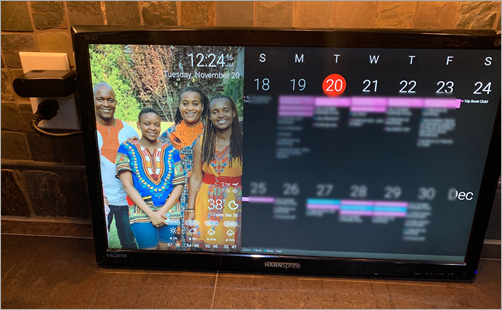 I chose DakBoard because it was simple, beautiful, and I was able to get the whole thing done in less than an hour. I’m sure I’ll spend many hours tweaking it through. There’s also the very popular MagicMIrror platform, so lots of choice and power in this space! See the full post on his blog here. This entry was posted on Tuesday, December 4th, 2018 at 11:20 pm	and is filed under DIY, R-Pi. You can follow any responses to this entry through the RSS 2.0 feed. You can skip to the end and leave a response. Pinging is currently not allowed.